Last week I did a post about the new Kiss Nail Dress nail art appliques I picked up, and on Friday I had a chance to test them out. They didn't turn out exactly like I imagined them to. They look pretty good from this angle, right? But when I tilt my nails up a little and look underneath... Uh oh. Big gaps. The ends of the strips at my free edge wouldn't stick down for anything. Filing off the excess only made it worse by leaving rough, torn edges (those little gems did not want to be filed!). And they wouldn't stick at the cuticle end, either. See how they stick up and create gaps around the cuticle there? You can probably see the gap a little better in the flash picture. To be completely honest with you, I only had enough patience to do one hand. I really wanted to do a full manicure and then leave them on all weekend to see how well they wore, but I just couldn't do it. I took these off immediately after I snapped these pictures. The problem I had with these is that they were really stiff and not very sticky. I have very curved nails. Bad combination. Another weird thing I noticed about them is that once you started to flex them to the shape of your nail, they didn't look smooth anymore. 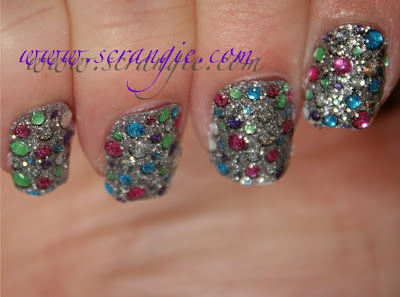 They looked speckled and glittery underneath the gems. Okay. First attempt failed. I really want to try these again because I think they look super cool, but I'm not sure if I'll ever be able to get them to work on my curved nails. These will likely work best on people with flat or only very slightly curved nails. When choosing the correct size decal for each nail, go a little bigger. They don't stretch like Incoco or Sally Hansen Salon Effects, so they end up being too narrow if you have curved nails and you pick the size that looks exact. Make sure they're at least room temperature. They're stiff, but they become a little more manageable the warmer they are. Rubbing them with your palms or hitting them with a little warm air from a hair dryer should do the trick. It helps if your hands are warm, too. Might be helpful to cut these down to your approximate nail length first, instead of after applying. Filing them down after they were on my nails made them want to lift up even more from the edge. No oil or moisture on the nail. Prep nails with alcohol or acetone first, and let it dry completely. Very important. These are not very sticky and anything that impedes adhesion at all will just ruin the strip. Since the strips aren't very sticky, avoid touching the adhesive side as much as possible. I think that if these were half as stiff and twice as sticky, I wouldn't have had a problem with them. Maybe my nails are just too curved. Bah. After filing, they look almost crooked.Whoever made/ designed them, didn't try them out for sure but they look really nice in the box! I've never tried anything like this before, but I picked these up (in the black bejeweled pattern) last week. I put them on Friday, and they still look decent today (except for the one nail I slammed in a door yesterday - youch!). I had heard to "soften" them with a hair dryer before application and then right after, so that's what I did. I didn't have many gaps (my nails are very curved as well). I did have a couple bubbles where I didn't get the sticker to lay perfectly flush to my nail, but you can't see them because of all the jewels. I will say that having really bumpy nails is quite a trip when you're used to just polish! I've received a lot of compliments on them though. Fun! Thanks so much for reviewing these - I keep seeing them around and have been curious! Now I'm glad I didn't spend a small fortune getting these sent across to the UK! Thanks for being our guinea pig. Now I'm glad I didn't spend a small fortune getting these sent across to the UK. Thanks for being our guinea pig! That's a shame, they look amazing! That's a bummer they didn't stick well. Maybe they'd work better on toes? That's a damn shame. Maybe they were too good to be true. These are fantastic looking. Shame they wouldn't lay down on your nails. Such a shame, they were gorgeous! I wonder if the design makes a difference, because I got a set of the zebra-print ones with fewer gems and they weren't that thick! I've already showered, done 2 loads of laundry and dishes, and a little gardening and they haven't come off or chipped. I keep thinking they are going to come off because they are a little awkward. 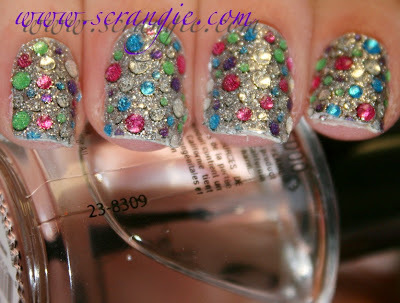 I wonder if these didn't work as well because they have all of the jewels on them. I just picked up some that don't have any jewels and I am curious to see how they do. 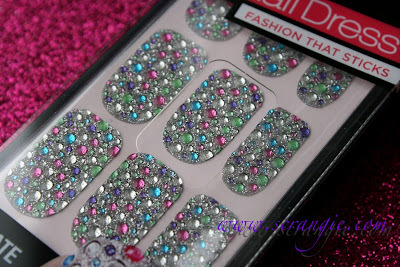 I love the Sally Hansen ones.